 Hey guys, I've been off the radar for awhile .. work you know .. been working on Siggraph for those of you who are familiar with software development. Just wanted to start a new topic here .. 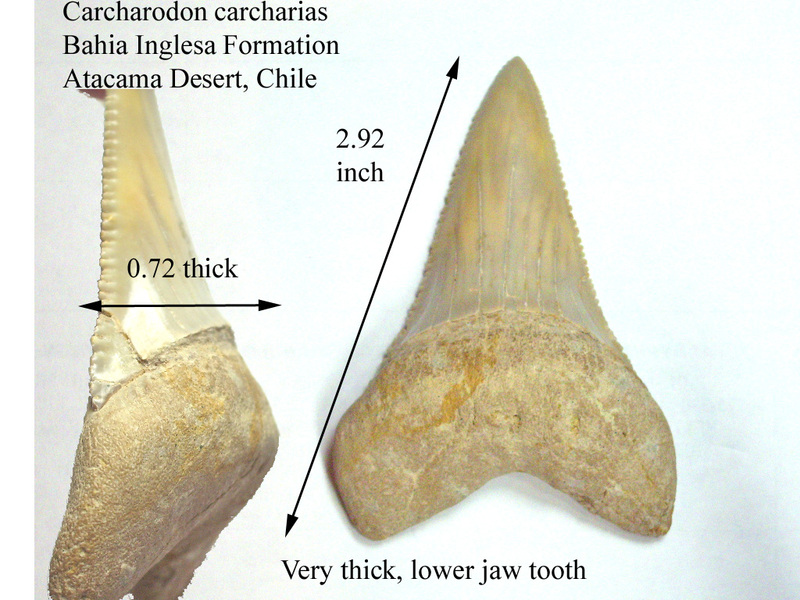 This one is right at 3.00"/7.62cm - The Bahia Ingesa Formation, near Caldera, Chili. Good to see you back. You a sw geek also? 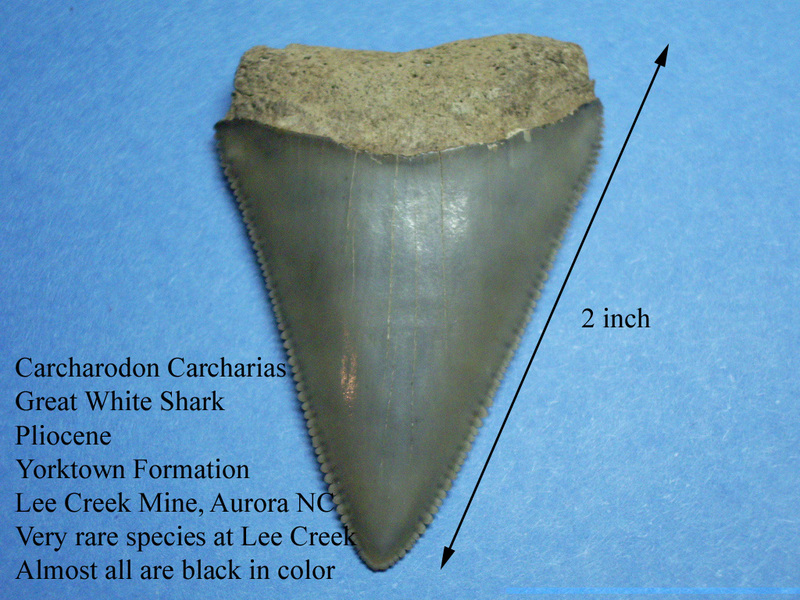 1) Tiny posterior Carcharocles from Lee Creek. Here are a few Great White's, a fairly common species. The first 2 are from a fairly uncommon location for GW's -Lee Creek. To make them even more uncommon, they AREN'T black, these are Yorktown Fm. The 3rd pic is a Great White with "cusps". 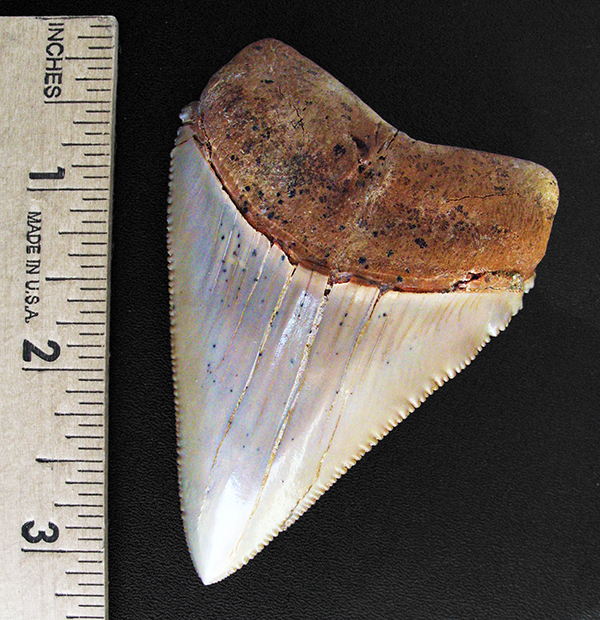 While they can be found on juveniles, this tooth is almost 2" long -no youngster. Lastly, a Mako from South Carolina with a decent helping of pyrite splattered on it. Pics don't do this one justice. Wow some fantastic teeth there! Eddie: yes I am a software geek .. last week we did some training in Toronto so that eats up time. Gorgeous teeth .. 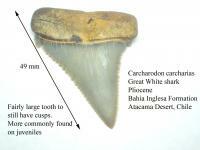 I looove the high quality Meherrin tooth as well as the Peruvian monster. Northern: Awesome examples of 'odd' material. 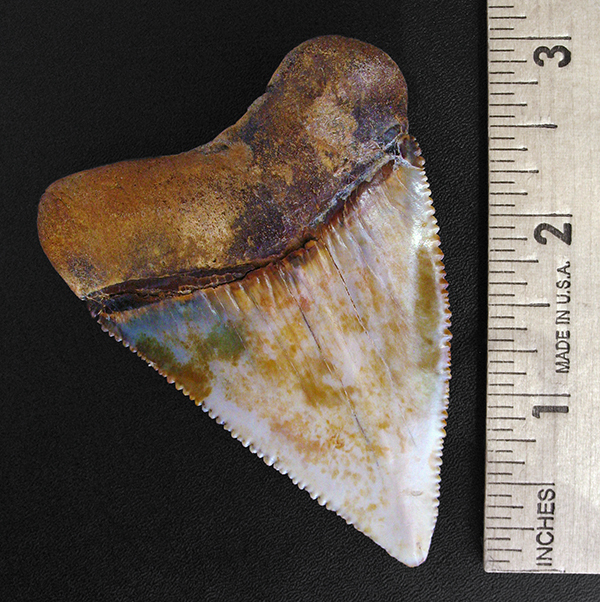 The pyriyization is pretty extreme on that tooth. 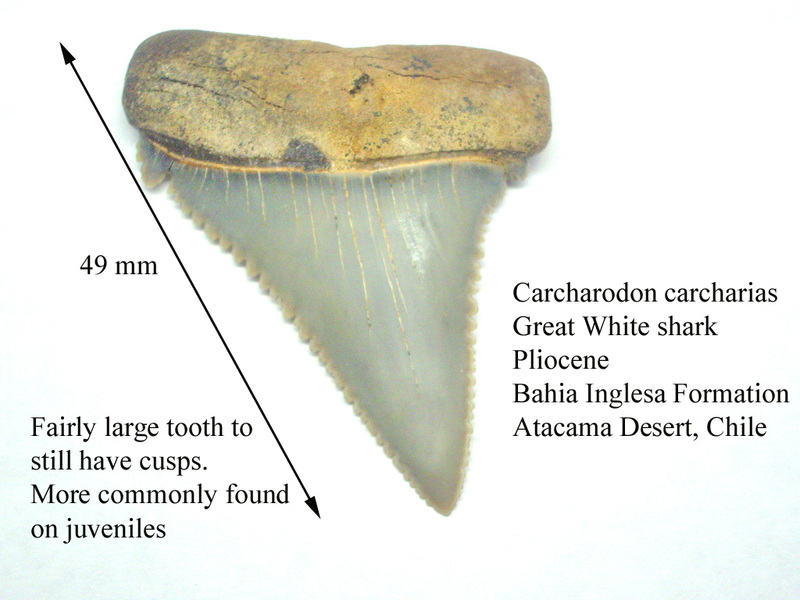 Also, love the cusped GW, that's a big tooth for having such large cusps. Marcel: I wish I'd known you were in Toronto. I'm about 45 minutes north of there. Shoot, well I'm in Toronto twice a year. The company I work for has a big office there. Next time I'll email well before I make it out there (maybe even organize a trade?! :-)). Hey FS, thanks ... I'll probably spend some time photographing some things today. btw that pathologocal angie in the patho topic is a once in a lifetime type of fossil. The stingray barb is just fantastic! Here's another from another mother. It has some very pronounced wrinkles with very large serrations on both edges just below the shoulders. 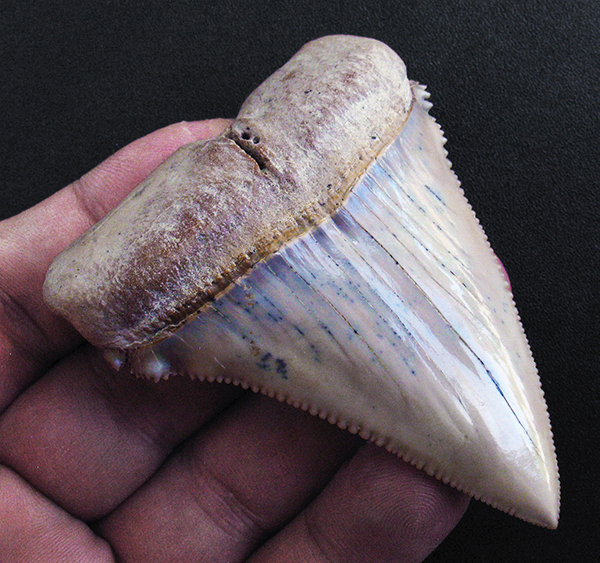 3.22"/8.18cm - The Bahia Ingesa Formation, near Caldera, Chile. Do you have a "rack" that you are using to "stretch" all these G/W teeth???? Really nice material! 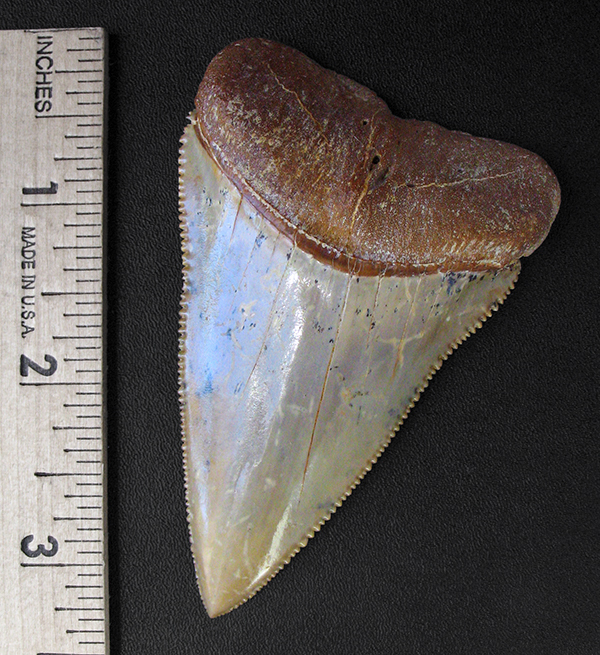 Without using your "rack" , what is the largest G/W tooth you have encountered?? Hey FS, I can build you one of these "racks" if you like The largest I had in my personal collection was 3.3/8" but I traded that for something else. I did see one that Steven Alter had for awhile, which was the largest I had seen come out of Chile and was just a hair (and I mean a hair) under 3.5". I'd heard Steve had a very large example of a G/W but never thought to ask him about it. PS. How long will it take to build the "rack"?? The 3 3/8 must have been a most impressive example of the species!! It took a lot for me to let that tooth go, but I got some rare material (non-shark) in return. Now that Chile has pretty much 'dried up' I kind of regret it, but hey, that's the way it goes. 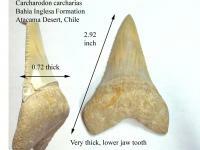 Here's another one fresh off the "rack" ..
3.29"/8.36cm - The Bahia Ingesa Formation, near Caldera, Chile. All joking aside - those are some really fantastic G/W teeth. Most impressive! Having one example over the "magic number" is quite an accomplishment but multiples are (at least for me) unheard of these days. OK I'll order a "rack" but how much is it going to cost me??? in all seriousness .. thanks guys. I'll photograph my larger than 3 inch Bakersfield makos tomorrow. I can't let Marcel post all the giant Great Whites. 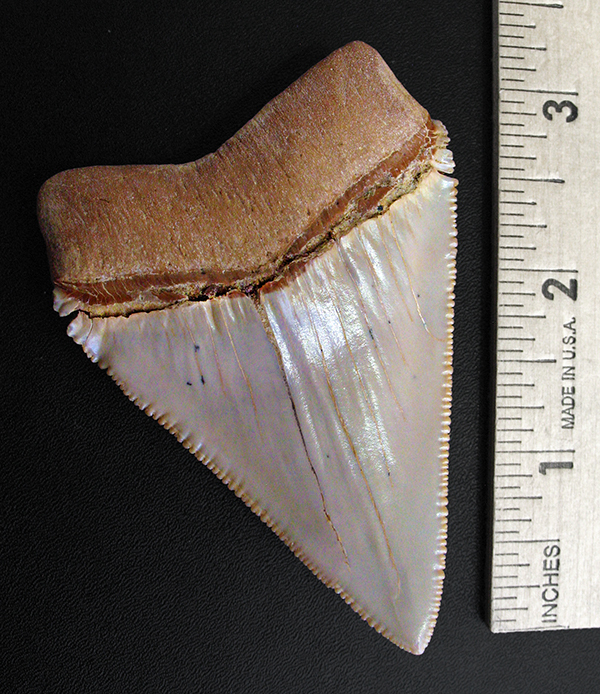 I'm not yet a member of the 3" club, but here is my largest- a VERY thick lower jaw tooth. Lowers are rarer than uppers and I've heard ratios like 10:1 (uppers:lowers) describing this. I can't let Marcel post all the giant Great Whites . 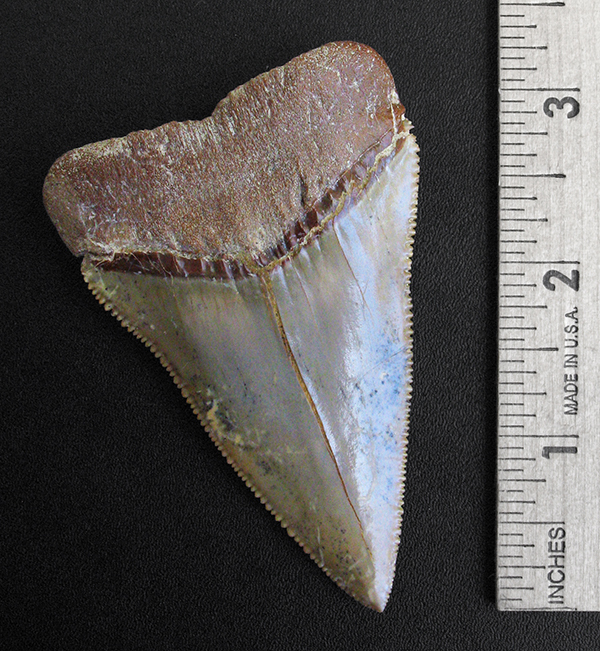 I'm not yet a member of the 3" club, but here is my largest- a VERY thick lower jaw tooth. Lowers are rarer than uppers and I've heard ratios like 10:1 (uppers:lowers) describing this. Hey Northern, NICE! I bet that's a monster when you hold it in the palm of your hand. That size, that thick . nice! 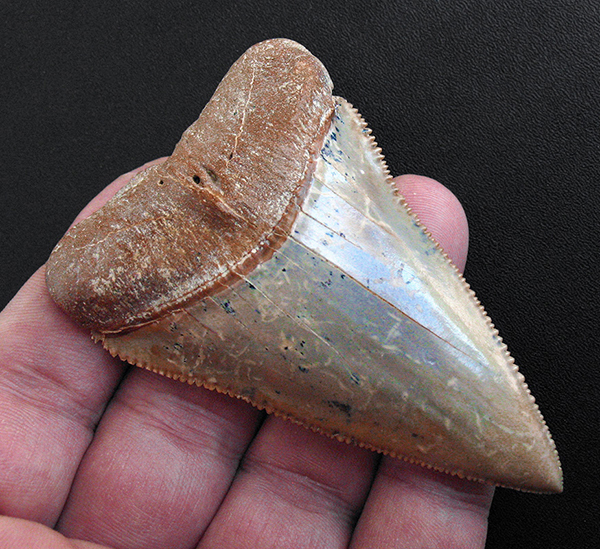 Wow, some very nice monster teeth in this thread. 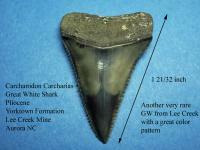 The Lee Creek GW teeth posted by Northern are sweet. 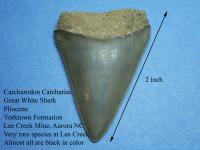 I've got a lot of Lee Creek teeth, but I've only had a few GW teeth, and all were black/reworked. 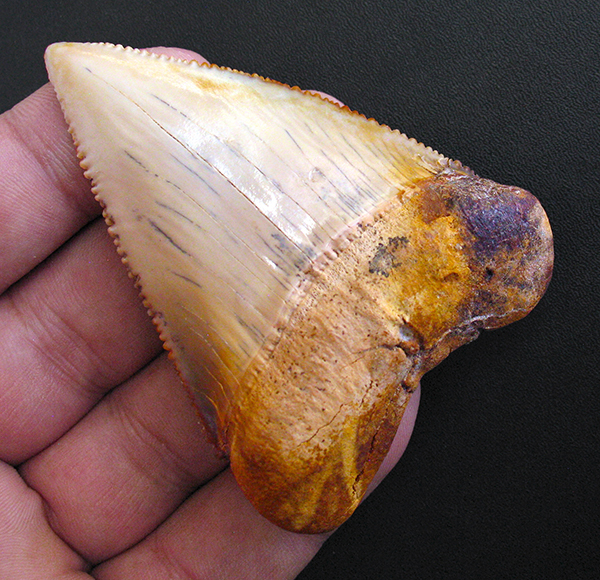 The big teeth get a lot of attention, and rightly so, but I like some of the extra small teeth from juveniles as well. Here are a few mini makos and a hemi. 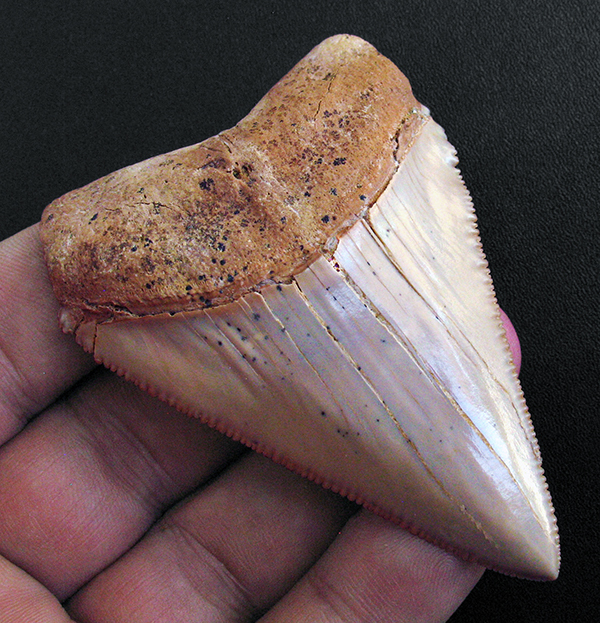 Send these mini teeth to Marcel for processing on his "rack"
I liked the mini Mako and hemi. I'll have to look through my LC material for some similar teeth. Here are a few Great White's, a fairly common species. 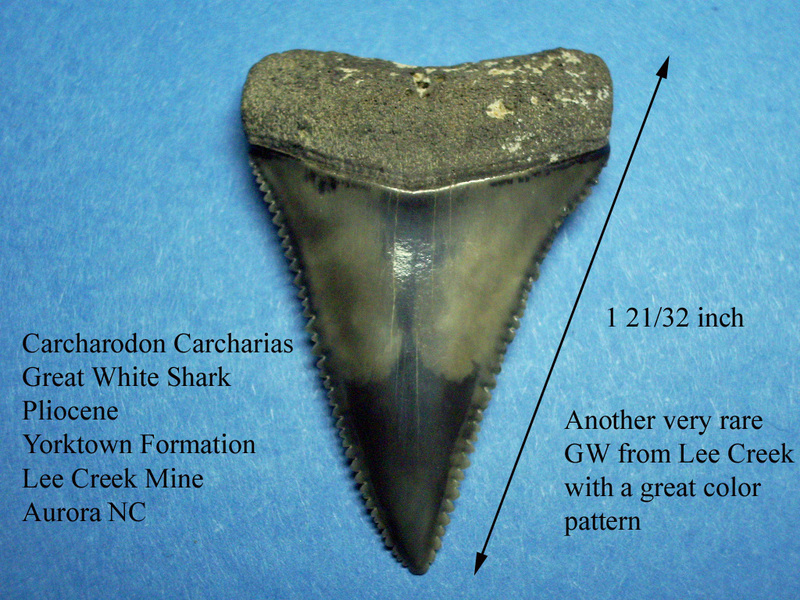 The first 2 are from a fairly uncommon location fro GW's -Lee Creek. To make them even more uncommon, they AREN'T black, these are Yorktown Fm. The 3rd pic is a Great White with "cusps". 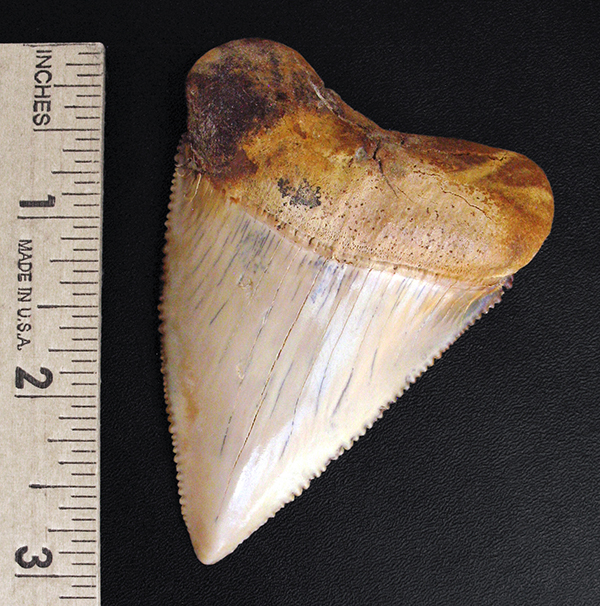 While they can be found on juveniles, this tooth is almost 2" long -no youngster. 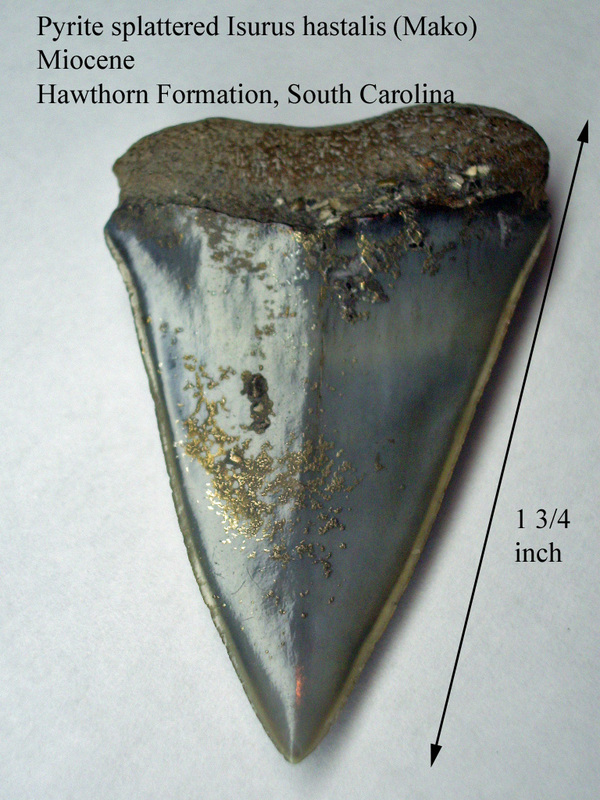 Lastly, a Mako from South Carolina with a decent helping of pyrite splattered on it. Pics don't do this one justice. 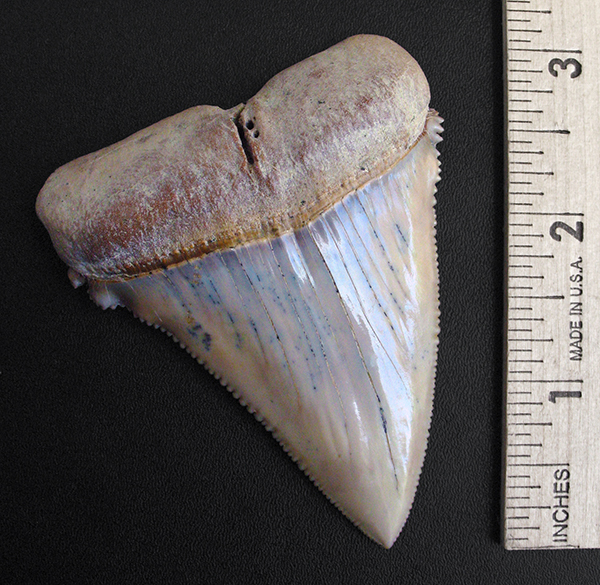 Those two L/C Great White teeth are spectacular - in particular the multi-colored second tooth. 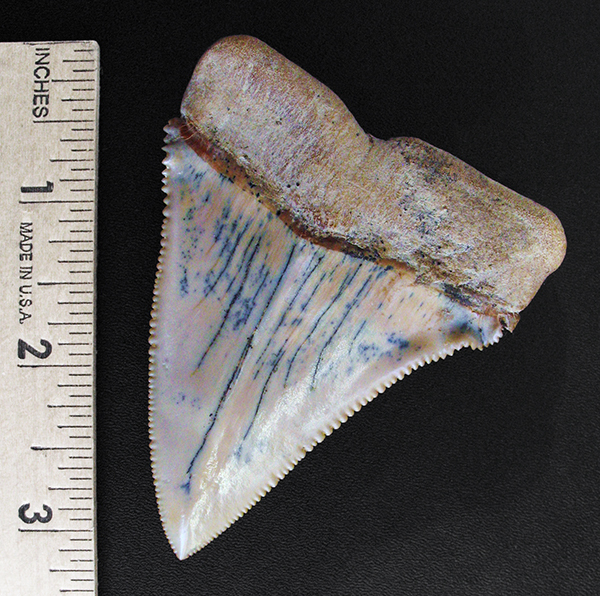 It's an accomplishment to find L/C Great White teeth that have roots as they are so often without such.